Shoo away insects with the Mirah Belle Bug Repellent Body Oil. This oil has a winning combination of essential oils such as lemongrass, basil, lemon, rosemary amongst many others which collectively help keep insects away naturally. Perfect for all skin types, this would put all your insect woes at bay! This product has been made using absolutely natural and organic ingredients that have properties, which would readily repel insects without any added efforts from your side. 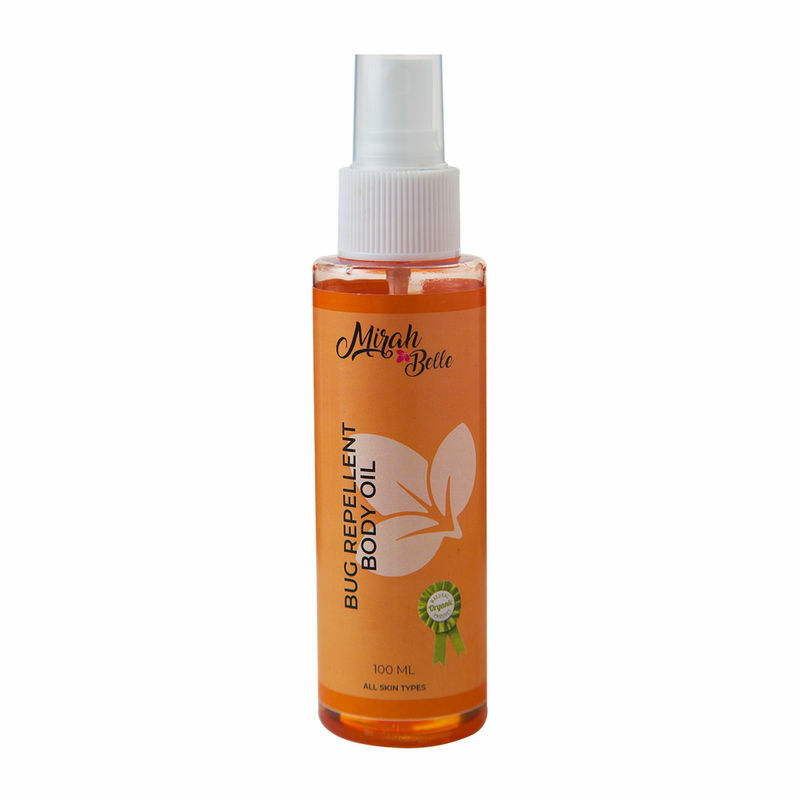 This oil has chemical free ingredients which helps to add a protective layer on the skin, making it softer and leaves the body smelling beautiful! It is completely safe for both children and adults. Lemongrass Essential Oil: This magical oil is known to relieve you of muscle pain and is widely used as a part of aromatherapy. It lessens any sort of body ache, and helps to ward off insects at the same time! It has a beautiful fragrance too. Basil Essential Oil: In case you feel worked out, this oil can work wonders to give you relaxation. When used topically on the skin, it adds a shine to your body and helps to lighten your skin tone. Its anti-bacterial and anti-inflammatory properties help to fight bacteria and bad odor, and aid in healing wounds quickly as well. Eucalyptus Essential Oil: This colorless oil has various medicinal properties in the sense that it acts as an antiseptic, is anti-inflammatory, and anti-bacterial in nature. It helps to fix cuts, bruises and other types of wounds, and keeps insects at bay as well. Lemon Extract: This extract from lemons is great for the skin. It helps to lighten the skin tone, prevents signs of aging, controls acne, and poses as a natural deodorant at the same time. Rosemary Oil Extract: Used extensively for skincare purposes, this essential oil is one of the main ingredients in various cosmetics. It improves blood circulation in the skin and makes your complexion better. Its limonene and camphor content helps to keep insects and bugs away. It is a natural anti-oxidant. It helps oils from going rancid. Jojoba Oil: This essential oil is loaded with antibacterial properties that keeps bacteria at bay. It keeps your skin moisturized and controls the development of skin acne giving you a clearer skin in no time. Neem Oil: We all are aware of the various medicinal properties that neem has. The essential oil extracted from neem leaves has the capability to shoo away insects owing to its germicide and pesticide properties. Apart from that, neem oil cures the acne problem as well.